Sewn Home’s products are always made to order in our shop in Timmins, Ontario. We take great pride in our workmanship and always strive to keep our quality second to none. The passion of our talented staff is evident in our products. All our design work is done using CAD software and spreadsheets to ensure consistency and eliminate waste. Seams are sewn using a double stitched flat-felled seam, which is a very strong, resilient and water-tight seam. Our main thread of choice is Sunstop® high-UV rated bonded polyester thread. This thread is extremely tough and stands up to all outdoor conditions making our seams very long-lasting. 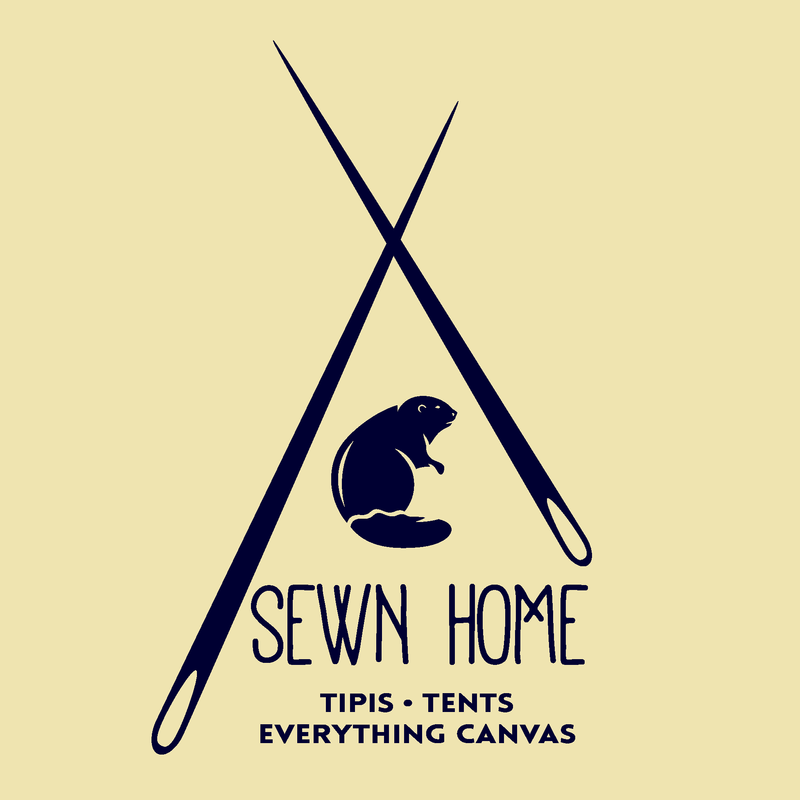 All our tents and tipis are made with 100% cotton army duck canvas. Army duck is a style of weave that uses double warp and double fill threads which are twisted to greatly increase the strength of the canvas relative to the weight. Our canvas has been treated with the Sunforger© process which leaves it pre-shrunk, mold and mildew resistant, water tight, UV resistant and flame retardant. 10.6oz which is a good all-around light-weight canvas. Keeping weight down means easier transport and set up. If used for shorter periods of time while being kept clean and dry in between uses, this canvas can last decades. If left up year-round, tents and tipis made with this canvas can last up to 5 years. 13oz is a big step up in durability. We recommend this weight of canvas for year-round set ups, long-season set ups, extreme weather and cold conditions. It is more resistant to wear and tear, will hold in more heat and has a longer life span. Left up year-round, tents and tipis made with this canvas can last up to 8 years. Being well-cared for and used for shorter periods of time, this canvas can last a lifetime. Our stove jacks are made of fiberglass/high heat silicone construction and are typically fitted with a canvas covering fastened with fire retardant hook-and-loop. We exclusively use YKK® zippers, the global leader in zippers, in all our zipper applications. Grommets, D-rings and other metal hardware are always stainless steel. We use polyester webbing as much as possible for its high-strength, natural UV-resistance and non-absorbent properties. Only the best quality, fire retardant, PVC materials such as scrim vinyl, mosquito screen and clear window vinyl is used in our products. We make our own aluminum poles in-house using structural tubing. Our steel connectors are fabricated and zinc-plated locally. Our wooden poles are made of douglas fir or quarter-sawn tamarack, milled and dried locally. These are very robust, stable woods with excellent rot-resistance. Our tipi poles are harvested very selectively and sustainably from large stands of black spruce, white spruce and tamarack in our area.